Art has been the very first language which we humans chose to communicate with. The symbols, signs and colours formed the basis of what we define as today's languages. The future of the world art market is inextricably bound up with changes to our society and its role in the world. We all work towards art fundamentally becoming more than an award, a respected space for ideas and knowledge that enrich the rapidly changing societies in our world. As India embarks on the largest investment in the arts in this region, it takes the lead in opening up an exchange of ideas through the art markets between competitive countries, so art is not merely an inward, national-looking process. A plethora of artists take on the challenge of portraying our culture and history around the globe. Hesham Malik is a leading contemporary artist of his time. Globally, he identifies himself as an Indian artist. Hesham currently holds the record for the most expensive painting sold by an Indian artist. Inspite of his consistent colossal success in the international art market, Hesham is a humble person who believes that art should not only be for the upper class but be made accessible to anyone. A lifelong artist, Hesham painted both for personal satisfaction as well to help charitable organizations. Hesham as a young man was expected to follow in his father’s footsteps and take over the family business but once he moved back to Dubai after obtaining his degree in International Business at Seneca College in Canada, he continued painting to raise money for charities. As an individual who has had health issues that have controlled his lifestyle, Hesham understands and empathizes with differently abled people and has often worked with and supported organizations working in this field. Hesham Malik will be displaying 20 of his artworks in an exhibition titled "Mukha – The Intimacy". "Mukhâ" has travelled from Beijing to Prague and from Prague to Goa, where one of the world’s most esteemed artists Hesham Malik has his roots intact. 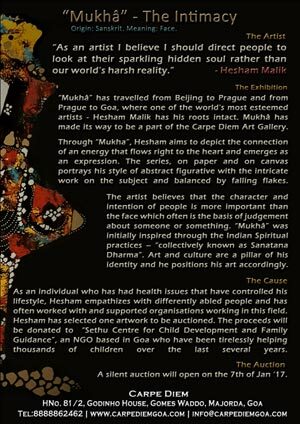 Mukhâ has made its way to be a part of the Carpe Diem Art Gallery – Majorda, Goa. "Mukhâ" is a Sanskrit word which means Face. The artist aims to depict the connection of the energy within us which flows right to the heart and leads to a body or facial expression. The series being displayed has 20 art pieces which were created by the artist years ago. The series, on paper and on canvas portrays his style of abstract figurative with the intricate work on the subject and balanced by falling flakes. Many collectors state that when they experience Hesham’s bold colourful figures, they feel a hidden power and spirituality. On the other hand the artist himself states "As an artist I believe I should direct people to look at their sparkling hidden soul rather than our world’s harsh reality. Moreover, recognition for an artist is not as important as the work itself." "Mukhâ" was initially inspired through the Indian Spiritual practices – "which have been collectively known as Sanatana Dharma" states Hesham. It is evident that the artist has identified art and culture as a pillar of his identity and positions his art accordingly. This is not only demonstrated by the extensive display of his art but also his involvement in guiding young artists of the new generation. "Mukhâ" – the face is what we all see and is often the basis of many of our judgments about someone or something. The artist argues that the character and intention of people should play a larger role than the face. However, at the same time he views the face and expression as two different things. Greatness in the work of art cannot be measured by its ability to be understood by the masses. Most artists spend more time looking and trying to figure out what the customer wants rather than what they seek to say. Hesham is one of the few artists who lives what he creates before his colours tell a tale. It’s one thing to see Hesham’s paintings or sketches in a book or online, but to see it in person is quite a different experience, to stand in front of his pieces is like sharing the same heart with the artist. The interesting thing about this art exhibition is to see how people connect with the artist’s experience and declaration. Hesham has selected one artwork "8 Griffons" to be auctioned. The proceeds will be donated to an NGO - "Sethu" - Centre for Child Development and Family Guidance who are based in Goa and who have been tirelessly helping thousands of children over the last several years. Sethu is a charitable trust based in Goa, India, which helps children get the best out of their lives as they grow and develop. Sethu’s mission is to be a bridge between children and their families, their schools and their communities to foster their complete development through assessments, therapy, educational initiatives, training, awareness and capacity building. "Mukha - The Intimacy" will open at Carpe Diem Art Gallery - Majorda Goa on the 7th of Jan’17 along with the auction for charity. The exhibition will remain open till 3rd Feb’17.